With people being more health conscious these days, we are often asked about the safety of E-juices and what exactly are they made of. Is there a difference between propylene glycol (PG) and vegetable glycerin (VG)? Can these ingredients be harmful to one’s health? And what about allergies and side effects? Are there any? We’ll do our best to clarify all of these concerns. If E-cigs are used as a ‘quit-smoking’ tool, obviously the smoker is concerned about their health. So, why switch one bad habit for another? The answer? You don’t! And here’s why. E-juices (aka eliquids) are made with propylene glycol (PG) and vegetable glycerin (VG), some flavorings, and of course nicotine at a tolerable dose. Nicotine can be the same dosage as a cigarette or slowly weaned down as desired while quitting smoking. Eventually, vaping can be a nicotine-free enjoyable experience. Some juices contain water and/or a sweetener. The percentage of PG to VG varies by brand. Most e-juices are organic (meaning no pesticides or other harmful ingredients). What IsThe Difference Between PG and VG? Vegetable glycerin is thicker than propylene glycol. 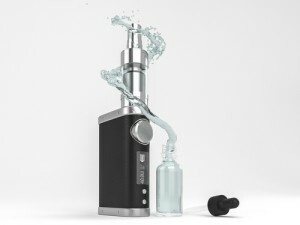 If the e-juice you select contains more VG, it will generate more vapor. This is often a personal choice and is frequently used by vaping ‘hobbyists’. E-juices that contain more PG carries the flavor much better, and delivers a greater throat hit which is especially important to people who are quitting tobacco products. E-juices are available as well in a formula created as 50PG/50VG e-juice to balance the two. Personal preference varies. Both PG and VG are used in many food products, and in medical and pharmaceutical products. Surprisingly, asthma inhalers also use PG. PG is generally recognized as safe (G.R.A.S.) by the FDA. This information can be found on the FDA website. Some people assume that PG is harmful because it's used in anti-freeze. The truth is PG is used as a safer alternative in anti-freeze and replaces the harmful ethylene glycol and makes a safer, non-toxic anti-freeze. It’s important not to confuse the two. What About Allergies and Side Effects of E-juices? Since there are numerous consumable food products made with these ingredients, you would most likely already know if you are allergic. The most common allergy symptoms from PG would be eczema, throat irritations, and nausea. If you are concerned about PG, switching to 100% VG should resolve these symptoms. PG is used in many cosmetics, shampoos, soaps, and numerous other products, and usually in small amounts. Side effects from both PG and VG would include dry mouth, sore throat, and increased thirst which all can be eliminated by drinking more water. These symptoms are found most often in beginners. Switching from tobacco cigarettes to ecigs can also cause similar side effects and can be withdrawal symptoms. Talk with your Vape Store representative about any concerns you may have.